Accountability is an increasingly important requirement in the commercial world. A business that is answerable to an authority or overseeing body is likely to be viewed with greater confidence than one that is not. However, it is not enough to provide a rubber stamp to qualify the competency of an organisation. In the world of analytical laboratories the body that sets the standards for quality in the UK is the United Kingdom Accreditation Service (UKAS – see www.ukas.org). 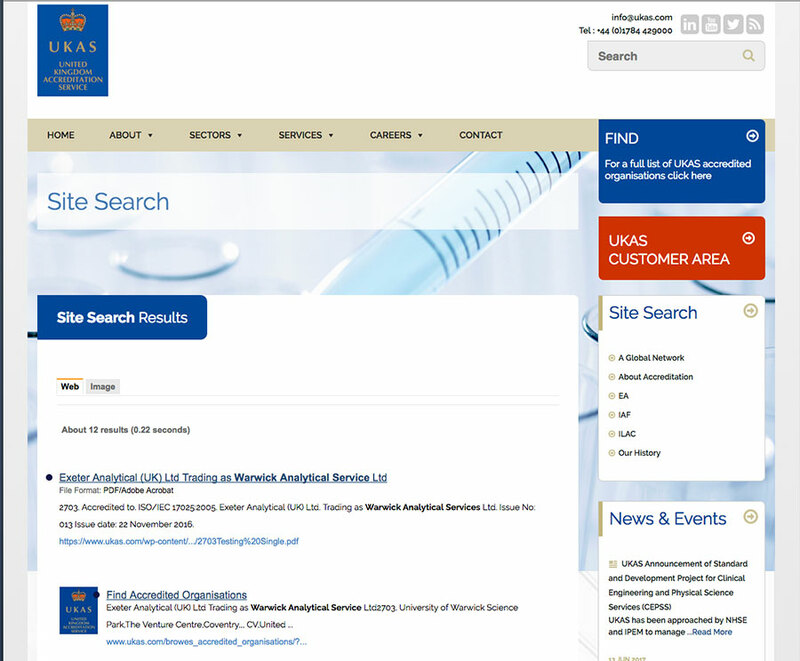 Since 2005 – WARWICK ANALYTICAL SERVICE has been accredited by UKAS to ISO 17025 (see figure 1 below). Warwick Analytical Service is audited once a year and the findings are reported within a few days. Any actions to ensure complete compliance with ISO17025 have to be carried out within a UKAS defined time scale. Failure to comply with these actions in a timely fashion can result in a loss of accreditation status. One of the requirements of UKAS is that peer checking of data is carried out, reducing the risk of errors. While no human checking system is perfect, a lot of simple errors can be avoided by this activity. Beyond quality accreditation – Warwick Analytical Service is continually looking for ways to check, benchmark and improve the quality of the analytical services it provides to customers. An example of this is Warwick Analytical Service regular participation in proficiency schemes for analysing a range of Metals, Carbon, Hydrogen, Nitrogen and Sulphur. This involves testing independently supplied samples for the various analytes of unknown concentrations. The results are matched to the actual levels and scored in comparison with other participating laboratories. By the nature of our business – WAS are regularly in contact with customers dealing with enquiries and responding to any enquiries about reported data promptly. Should your samples and any data arising from them be especially commercially sensitive – WAS is happy to sign confidentiality agreements. We welcome customer or potential customer visits to our facilities – we have an introduction video on our website. At Warwick Analytical Service the quality of the analytical data that we provide to you is paramount. We offer a friendly, highly informed and responsive service that is backed up by the assurance of high quality data accredited to ISO 17025 and BSi 9001. From our modern purpose built, air conditioned laboratory facilities in Coventry, UK – Warwick Analytical Service offers a wide range of analytical techniques including elemental analysis, and optical rotation. We can also arrange, NMR, MS, FT-IR, and thermal analysis on a contract basis.